NOW combines two nutrients extensively researched for their benefits for the bones, teeth and cardiovascular system. 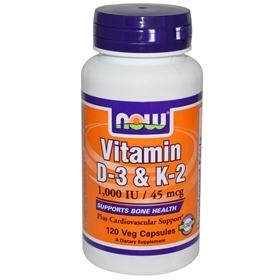 Vitamin D3 promotes calcium absorption and calcium transport to bones. Recent studies indicate that Vitamin D3 may support healthy insulin action and glucose metabolism and may have a positive impact on immune function. Vitamin K2, likewise is beneficial in the areas of bone and cardiovascular health. Vitamin K is critical for the formation of healthy strong bone matrix. Bone quality is dependent on the presence of adequate Vitamin K. Vitamin K's role in arterial health revolves around its ability to support proper calcium metabolism in vascular structures. Vitamin K2 is the most biologically active form. Vitamin K plays an important role in keeping calcium in the bones and out of the arteries. It is one of the most important nutritional interventions for improving your bone density. It serves as the biological glue that helps put calcium and other important minerals into your bone matrix.There are a number of Japanese studies that have shown that vitamin K2 completely reverses bone loss and in some cases even increases bone mass in people with osteoporosis. Vitamin D promotes calcium absorption and calcium transport to bones. Most people are low in Vitamin D, so ask your doctor to test your D levels with a simple blood test. If you are low in D, it could lead to many health problems such as lower immune function, increased risk of multiple sclerosis, and developing heart disease. For women who are looking to become pregnant, it is critical to have your D levels checked. One recent study showed That there is "considerable evidence that low maternal levels of 25 hydroxyvitamin D are associated with adverse outcomes for both mother and fetus in pregnancy as well as the neonate and child". It is also believed that good levels of vitamin D is protective against all cancers. Suggested Usage: As a dietary supplement, take 1 Vcap® 1 to 2 times daily with meals. Consider taking this product in combination with a NOW® Calcium supplement. Vitamin D in forms known as calcitriol or calcipotriene is applied directly to the skin for a particular type of psoriasis. If you travel to Canada, you may have noticed that Canada recognizes the importance of vitamin D in the prevention of osteoporosis. It allows this health claim for foods that contain calcium: "A healthy diet with adequate calcium and vitamin D, and regular physical activity, help to achieve strong bones and may reduce the risk of osteoporosis.” But the US version of this osteoporosis health claim does not yet include vitamin D.
Vitamin D is required for the regulation of the minerals calcium and phosphorus found in the body. It also plays an important role in maintaining proper bone structure. Sun exposure is an easy, reliable way for most people to get vitamin D. Exposure of the hands, face, arms, and legs to sunlight two to three times a week for about one-fourth of the time it would take to develop a mild sunburn will cause the skin to produce enough vitamin D. The necessary exposure time varies with age, skin type, season, time of day, etc. It’s amazing how quickly adequate levels of vitamin D can be restored by sunlight. Just 6 days of casual sunlight exposure without sunscreen can make up for 49 days of no sunlight exposure. Body fat acts like a kind of storage battery for vitamin D. During periods of sunlight, vitamin D is stored in fatty fat and then released when sunlight is gone. Older people are also at risk for vitamin D deficiency. They are less likely to spend time in the sun, have fewer “receptors” in their skin that convert sunlight to vitamin D, may not get vitamin D in their diet, may have trouble absorbing vitamin D even if they do get it in their diet, and may have more trouble converting dietary vitamin D to a useful form due to aging kidneys. In fact, the risk for vitamin D deficiency in people over 65 years of age is very high. Surprisingly, as many as 40% of older people even in sunny climates such as South Florida don’t have enough vitamin D in their systems. Vitamin D supplements may be necessary for older people, people living in northern latitudes, and for dark-skinned people who need extra time in the sun, but don’t get it. Softening of the bones (osteomalacia). Taking vitamin D (cholecalciferol) is effective for treating softening of the bones. Also, taking vitamin D (calcifediol) is effective for treating softening of the bones due to liver disease. In addition, taking vitamin D (ergocalciferol) is effective for treating softening of the bones caused by medications or poor absorption syndromes. Preventing falls in older people. Researchers have observed that people who do not have enough vitamin D tend to fall more often than people who do. Taking a vitamin D supplement seems to reduce the risk of falling by up to 22%. Higher doses of vitamin D are more effective than lower doses. One study found that taking 800 IU of vitamin D reduced the risk of falling, but lower doses did not. Cancer. Some research shows that people who take a high-dose vitamin D supplement plus calcium might have a lower risk of developing certain types of cancer. However, taking vitamin D alone does not appear to reduce the risk of cancer. Cavities. Research suggests that taking vitamin D3 (cholecalciferol) reduces the risk of cavities by 49% and vitamin D2 (ergocalciferol) reduces the risk by 36% in infants, children and adolescents. Breast cancer. Evidence on the effects of vitamin D on breast cancer risk is inconsistent. The best evidence comes from a large study called the Women’s Health Initiative, which found that taking 400 IU of vitamin D and 1000 mg of calcium per day does not lower the chance of getting breast cancer when taken by postmenopausal women. However, the possibility remains that high doses of vitamin D might lower breast cancer risk in younger women. Muscle strength. Taking vitamin D (cholecalciferol) by mouth daily does not increase muscle strength or improve physicical performance in healthy older men who are not vitamin D deficient. Bone loss in people with kidney transplants. Taking vitamin D (calcitriol) daily together with calcium carbonate does not decrease bone loss in people with kidney transplants. Tuberculosis. Vitamin D does not appear to help cure tuberculosis infections. Asthma. Some research suggests that people with asthma are more likely to have low vitamin D levels. In children with asthma, taking a vitamin D supplement might reduce the chance of an asthma attack during a cold or other respiratory infection. However, it is too soon to know if taking a vitamin D supplement can prevent or treat asthma symptoms. Heart disease. Research suggests that people with low levels of vitamin D in their blood are more likely to develop heart disease, including heart failure, than people with higher vitamin D levels. However, taking vitamin D does not seem to extend the life of people with heart failure. Kidney disease. Research suggests that vitamin D decreases parathyroid hormone levels in people with chronic kidney disease. However, taking vitamin D does not appear to lower the risk of death in people with kidney disease. Chronic obstructive pulmonary disease (COPD). Some research shows that people with COPD have lower than normal vitamin D levels. However, there is not enough information to know if taking a vitamin D supplement can decrease symptoms of COPD. Mental function. Research shows that vitamin D levels are not linked to improved or worsened mental function. Colorectal cancer. It is not clear if vitamin D might benefit colorectal cancer. Some research shows that calcium intake is linked with a reduced risk of developing colorectal cancer. However, this effect is not seen in people with low vitamin D levels, indicating that vitamin D might be an important factor. However, other research suggests that taking vitamin D with calcium is not associated with a lower risk of colorectal cancer. Diabetes. Research shows that people with lower vitamin D levels are more likely to develop type 2 diabetes compared to people with higher vitamin D levels. However, there is no reliable evidence that taking vitamin D supplements can treat or prevent type 2 diabetes. Early evidence suggests that giving vitamin D supplements to infants daily during the first year of life is linked to a lower risk of developing type 1 diabetes later in life. Heart failure. Some research suggests that people with low vitamin D levels have an increased risk of developing heart failure compared to those with higher vitamin D levels. However, other research shows that taking vitamin D (cholecalciferol) daily does not decrease the risk of death in people with heart failure. High cholesterol. People with lower vitamin D levels seem to be much more likely to have high cholesterol than people with higher vitamin D levels. Limited research shows that taking calcium plus vitamin D daily, in combination with a low-calorie diet, significantly raises “good (HDL) cholesterol” and lowers “bad (LDL) cholesterol” in overweight women. However, taking calcium plus vitamin D without dietary restrictions does not reduce LDL cholesterol levels. Other research suggests that vitamin D might actually increase LDL and have no beneficial effect on HDL, triglycerides, or total cholesterol. High blood pressure. Research suggests that lower vitamin D levels are associated with a higher risk of developing high blood pressure. However, research is inconsistent. Some research suggests that vitamin D can reduce blood pressure in people with or without high blood pressure. Other research shows that taking vitamin D (cholecalciferol) daily in combination with calcium does not lower blood pressure or reduce the risk of developing high blood pressure in postmenopausal women. Low birth weight. Research suggests that mothers who take vitamin D supplements during pregnancy have a lower risk of delivering a low birth weight infant. Metabolic syndrome. There is conflicting evidence about the link between vitamin D and metabolic syndrome. Some research suggests that women aged at least 45 years who consume high amounts of vitamin D or take vitamin D supplements do not have a lower risk of developing metabolic syndrome. However, other research suggests that higher vitamin D levels are linked to a lower risk of metabolic syndrome. Overall death risk. Research suggests that having low vitamin D levels is associated with an increased risk of death from any cause. Some research suggests that people who take vitamin D supplements daily have a lower risk of dying. However, other research suggests that vitamin D reduces the risk of death only when taking together with calcium. A blood cell disease called myelodysplastic syndrome. Taking vitamin D (calcitriol or calcifediol) by mouth seems to help people with myelodysplastic syndrome. Gum disease. Research shows that higher blood levels of vitamin D seem to be linked with a reduced risk of gum disease in people 50 years of age or older. However, this does not seem to be true for adults younger than 50 years. Premenstrual syndrome (PMS). There is some evidence that consuming more vitamin D from the diet might help to prevent PMS or reduce symptoms. Taking vitamin D supplements does not seem to prevent PMS. However taking vitamin D plus calcium seems to reduce PMS symptoms. A muscle disease called proximal myopathy. Taking vitamin D (ergocalciferol) by mouth or administering it as a shot into the muscle seems to help treat a muscle disease associated with vitamin D deficiency. Seasonal depression (seasonal affective disorder). Early research suggests that vitamin D improves symptoms of seasonal depression. Non-cancerous wart-like growths on the skin (seborrheic keratosis). Early research suggests that applying vitamin D3 (cholecalciferol) to the skin might reduce tumor size in some people with seborrheic keratosis. Muscle pain caused by medications called statins. Some reports suggest that taking vitamin D supplements can decrease symptoms of muscle pain in people taking statin drugs. Vaginal atrophy. Early research shows that taking vitamin D supplements for a least one year improves the surface of the vaginal wall. However, it does not seem to improve symptoms of vaginal atrophy. Warts. Reports suggest that applying maxacalcitol, which comes from vitamin D3, to the skin, can reduce viral warts in people with weakened immune systems. More evidence is needed to rate vitamin D for these uses.